Routes Less Travelled: Do You Know The Way To Thunder Bay? 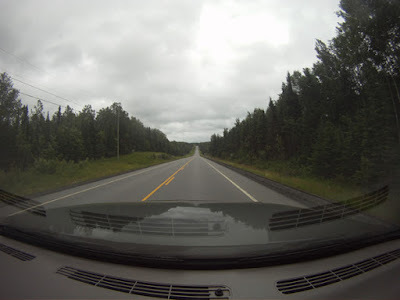 This less travelled route followed Ontario Highway 71 from the city of Kenora in Northwestern Ontario, south to Fort Frances on the Canada/US border then east on Highway 11 to Thunder Bay. Its longer and slower in some parts but much less congested meaning RV’ers can motor along at their own pace without feeling pushed or intimidated by hordes of impatient drivers. As a bonus, the scenery was quite lovely and picturesque in places. After spending several delightful days exploring the city of Winnipeg, my wife and I continued east along the TransCanada Highway, heading towards Thunder Bay. From Winnipeg, almost to the Ontario border, the highway was four lanes wide and in decent shape but for a few rough patches. 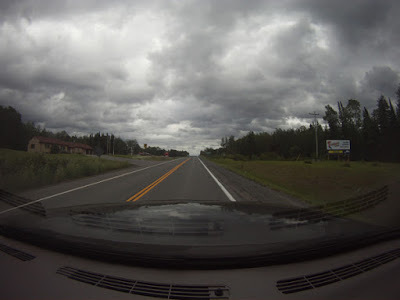 Rough patches or not, it was infinitely better than the two lanes we were funnelled into near the Ontario border. That’s where the route got “interesting” as RV’ers, truckers, motorists, bikers, speed demons and dawdlers were all forced to share the same piece of pavement. It was also where the prairie landscape finally gave way to an endless tableau of trees, rocks, lakes, ponds and muskeg which made up the Canadian Shield. At first, the forests and granite outcroppings seemed quite novel after the wide-open spaces of the treeless prairies but the novelty quickly passed, replaced by the boredom of endless green and grey. As we crossed into Ontario, I noticed that the TransCanada Highway, the route which began in Victoria, B.C. and traversed 4 western provinces as Highway 1, was now replaced by Ontario Highway 17. 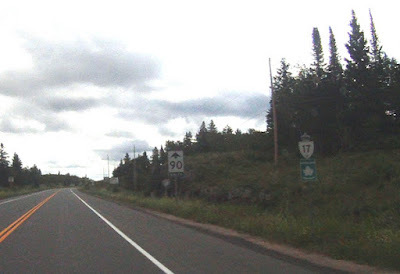 Technically, Highway 17 was still the TransCanada but, there was little evidence in the way of signs or markers to suggest it was still the nation’s cross country highway. Just over the border, past the “Welcome To Ontario” sign was a large tourist bureau with a sizeable parking lot and rest room facilities. It seemed like the perfect place to stop, stretch and pick up some travel information. Unfortunately, the office was closed - not just for the day but permanently - or so it seemed. Hardly a hospitable welcome to visitors from Western Canada. Ontario Tourist Bureau - Closed! 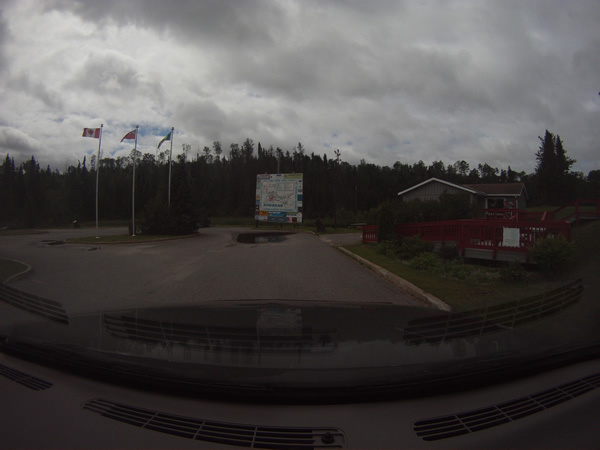 Continuing on, we reached the town of Kenora, about 70km east of the Ontario border. Even though the community was well off the TransCanada Highway, there seemed to be a lot of tourists wandering the streets. According to the welcome sign, 16,000 people called this northern community their home but, it felt much larger. Located at the northern end of Lake of the Woods, Kenora appeared to be a town in transition. Once a rail and forestry hub, the community now had a definite tourist vibe. City buildings were adorned with colourful murals while a huge tent-like structure dominated a downtown park. 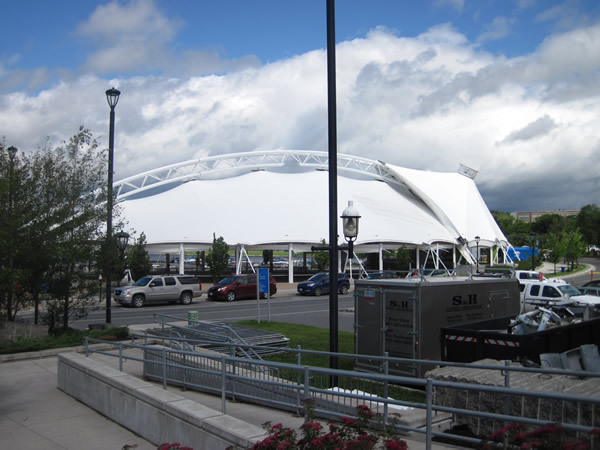 Obviously, there were a lot of events and performances to warrant a structure that large. 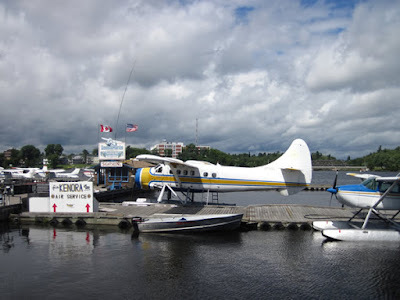 Nearby, the harbour was filled with pleasure boats and float planes along with the M.S. Kenora, a large tour boat used for sight-seeing trips around the lake. 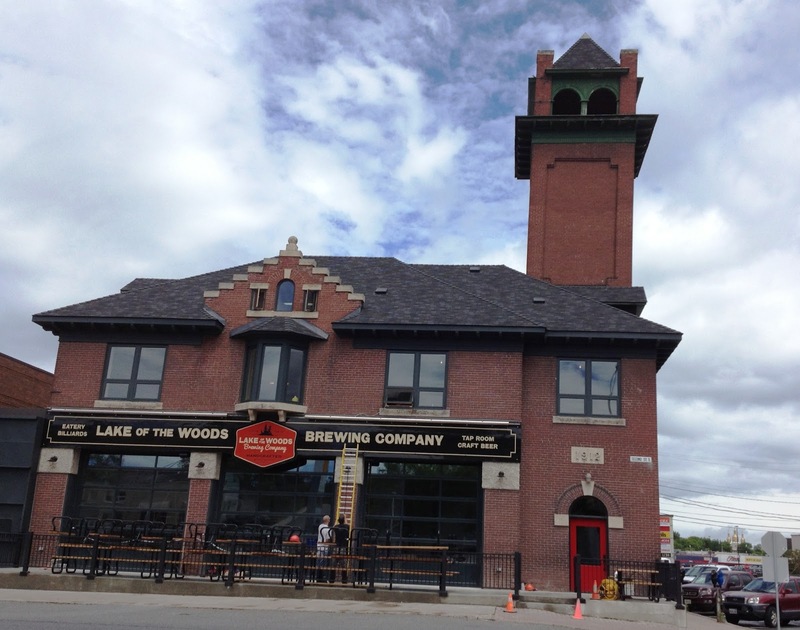 Downtown was populated mainly by souvenir shops, gift stores, cafes and restaurants while uptown, the “Lake of the Woods Brewing Co.” brew pub was doing a lively business. The clincher however, was the inordinate number of real estate agencies and rental companies listing cabins, cottages and summer homes for sale, lease or rent. Lake of the Woods was a huge yet idyllic body of water with a shoreline made up of innumerable bays and inlets. Judging by all the sales and rental listings, most of those inlets were covered by summer cottages and vacation dwellings. No wonder the town seemed so large. With all the summer renters, residents and visitors, the population must double. About 10km past Kenora, was the junction with Highway 71 - the beginning of my alternate route to Thunder Bay. 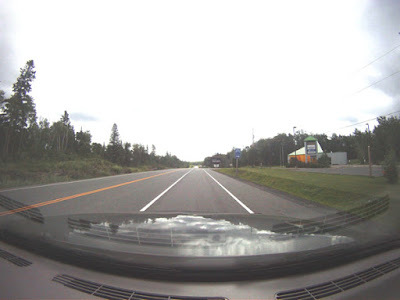 As I pulled off the TransCanada Highway, I crossed my fingers and hoped I had not made a huge mistake. Never having driven the route before, I had no idea what to expect. Almost immediately, the volume of traffic diminished. Apparently, few others wanted to take the longer route. The highway itself was in excellent condition with a smooth, patch free surface and wide shoulders – a pleasure to drive. 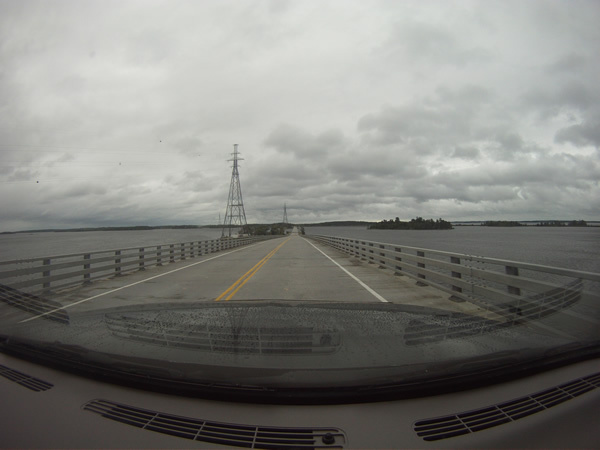 The only real difference between it and Highway 17 – the TransCanada - was the speed limit. The TransCanada’s top speed was 90kph. Highway 71 had a limit of 80kph. That seemed quite low for a highway this good but then, we were in no hurry and it gave us lots of time to enjoy the scenery which seemed far more interesting than along the TransCanada. 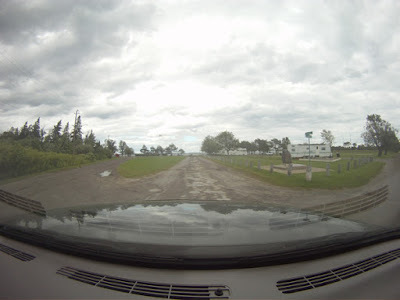 The route more or less paralleled the eastern edge of Lake of the Woods for much of its length which also happened to be where an amazing number of lodges, resorts and fishing camps were located. It also passed through several quaint communities with names like Sioux Narrows and Nestor Falls as well as by several spectacular Lake of the Woods viewpoints. 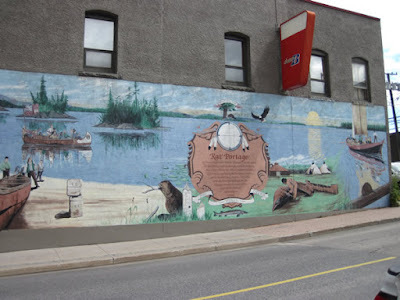 By late afternoon, we had reached the town of Fort Frances where we decided to spend the night. Located on the Canadian side of the Rainy River which also served as the boundary between Canada and the United States, this community of about 8,000 was more about industry than tourism. That was evident from a huge pulp mill situated a few blocks from the city center. As the name suggests, Fort France was once an important outpost for the Hudson's Bay company. Today all that remains is a commemorative plaque. The plaque was located in a park along the banks of Rainy River. Near by was a municipal campground at Pither’s Point Park on the eastern edge of town, near the confluence of Rainy River and Rainy Lake. The park offered 15 serviced sites (water and 30-amp electricity) plus some tenting spots, washrooms, a playground and sand beach. Rates were around $30.00 a night for a serviced site. The next morning, we were back on the road, now headed east on Highway 11. Eventually, Highway 11 and the TransCanada Highway would converge just outside of Thunder Bay but that wouldn’t happen for another 300km. The highway itself was in relatively good condition but did have a few pot holes, cracks or frost heaves. The scenery however, was far less appealing. 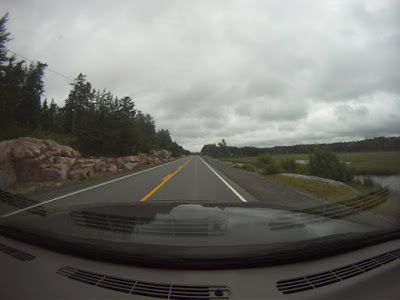 It was the same monotony of trees, rocks and muskeg we had “enjoyed” from the Ontario border to Kenora. No resorts, fishing camps, or lake views here. In fact, other than the occasional side road, there was little evidence of any human activity or habitation. On the plus side, the highway showed little evidence of human activity either and was almost traffic free. About halfway between the Fort Frances and Thunder Bay lay the town of Atikokan, one of the very few spots along Highway 11 where food and fuel were available. At one time, Atikokan had been a bustling community supported by forestry and a huge iron-ore mine. Unfortunately, the mine closed in the mid-1980’s and forestry was on the decline. On the plus side, tourism was on the rise (sound familiar). The town was one of the main entry points to Quetico Provincial Park, a huge wilderness area along the Canada/US border, famous for its excellent canoeing, camping and fishing. 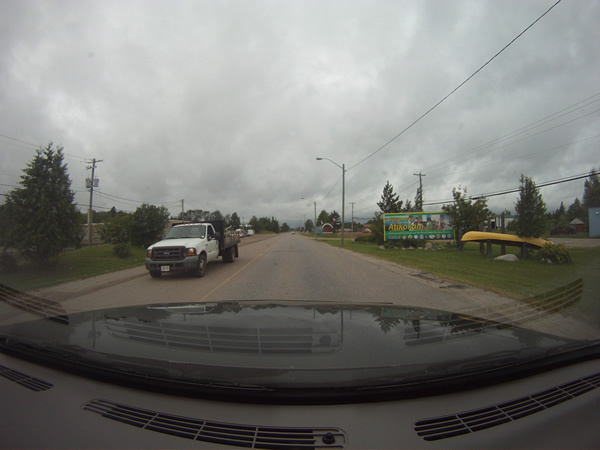 That may have been one of the reasons why Atikokan billed itself as the “Canoeing Capital of Canada”. While I can’t comment on the validity of the claim, I did notice a number of outdoor expedition companies operating from the community. The town was about three kilometers off the main highway. At the Highway 17 turn-off was an excellent tourist information office with an amazing amount of literature on local attractions, activities and events plus very knowledgeable hosts. For anyone thinking about camping, canoeing, hiking, fishing or cycling in the area, this would be a great first stop. Past Atikokan, the world of rocks, ponds, muskeg and trees continued on without interruption almost all the way to Kakabeka Falls, a provincial park about 30km west of Thunder Bay. 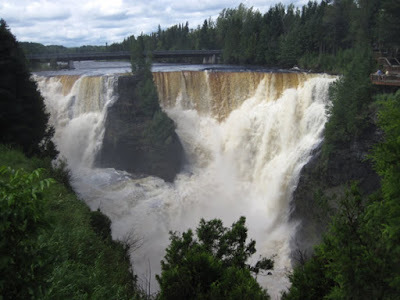 The park featured hiking trails, walkways, observation areas, a souvenir shop, restaurant, camping area and of course, the falls themselves which were often referred to as the “Niagara of the North”. While not nearly as big as the real Niagara, they were still impressive none the less and definitely worth stopping for. From Kakabeka Falls, it was a short jaunt into Thunder Bay, our destination for this leg of the trip.